The Lattemore documents are all ready, awaiting only your Letter. 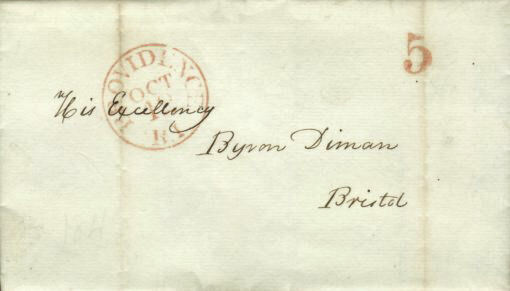 Byron Diman was born in Bristol, Rhode Island in 1795, the eldest son of Jeremiah and Hannah Diman. He was tutored privately by Alexander Griswold, (later Bishop of Massachusetts) and at the age of 16, he entered the counting house of James D' Wolf as an apprentice. 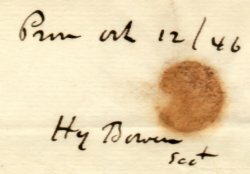 See: 1825 James D'Wolf Letter for further information. After leaving the service of James D'Wolf, Governor Diman became heavily engaged in the shipping and whaling industries. He acquired his first ship in 1822 and over the next half-century, he was owner or part owner of over twenty-one brigs and ships employed in Coastal Trade, Whaling and the West Indian Trade. After the decline of the Whale fishery, he turned his attention to manufacturing. He was President of the Bristol Steam Mill and served as one of the Directors of the Pokanoket Mill. He was also the President of the Bank of Bristol. Governor Diman served for several years in the lower house and then as a State Senator. He also served as Lieutenant Governor for three years. He was elected Governor of the State of Rhode Island in 1846 as a member of the "Law and Order" party. He served as Governor from May 6, 1846 to May 4, 1847. NOTE: The Law and Order Party was a coalition of Whigs and rural Democrats originally formed in answer to Thomas Wilson Dorr's "Progressive People's Constitution." Dorr was elected governor under this document in 1842, however the Law and Order party reelected Governor Samuel Ward King. SEE: Dorr Rebellion Event Cover for further information. Governor Diman married Abigail Alden Wight in 1823 and married his second wife, Elizabeth Ann Wood in 1855. It has been said that Governor Diman had a remarkable memory and that he was also fond of historical research. Governor Byron Diman died in Bristol, Rhode Island on August 1, 1865. 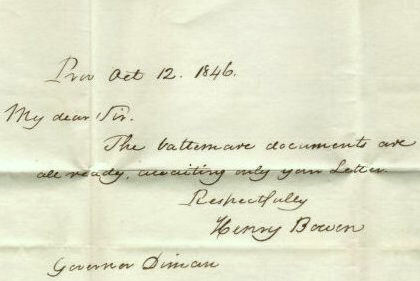 The author of the letter, Henry Bowen was the son of Jabez and Sarah Bowen. He was born in 1785 and died in 1867. He served as Rhode Island's Secretary of State from 1819 to 1849.